Orange Carrot Smoothie will make you feel like a rock star! Packed with vitamins A and C from all the "orange" ingredients. 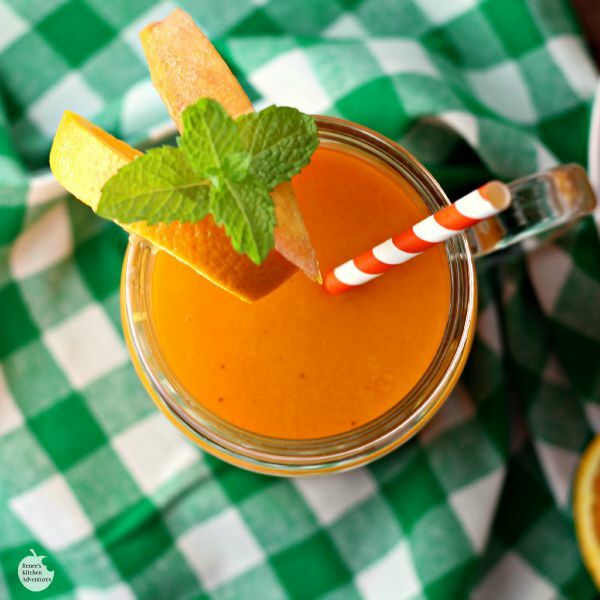 Orange juice, carrot juice, and peaches come together for a flavor trifecta in this delicious and healthy smoothie! It's time once again for another installment of The Secret Recipe Club, a group of like minded bloggers discovering new blogs and recipes each month. This month, I was assigned to the blog Cookaholic Wife. Nichole is the author behind this "new to me" delicious collection of recipes! Nichole describes herself as a self taught cook who lives in Maryland with her husband Tom and two cats. Nichole has been blogging for five years. As I browsed Cookaholic Wife's recipe index for a recipe to make for this post, I discovered several recipe titles that caught my eye, Her Arroz con Pollo will be making an appearance on my menu soon as will her Savory Breakfast Risotto. Yum! But for this post today, I decided to make her Orange Carrot Smoothie. 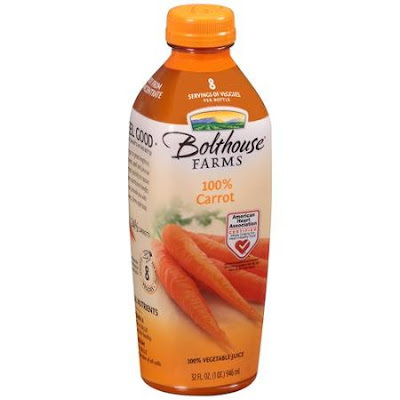 I decided to make this recipe because I LOVE this Bolthouse Farms® 100% Carrot Juice and almost always have some in my fridge. When I saw this smoothie was made with said carrot juice, well, I couldn't pass it up! If you aren't familiar with this carrot juice, you need to change that. This stuff is seriously good and I'm not even a big fan of carrots. It's slightly sweet from the natural sugars of carrots and it's not "earthy" tasting at all. 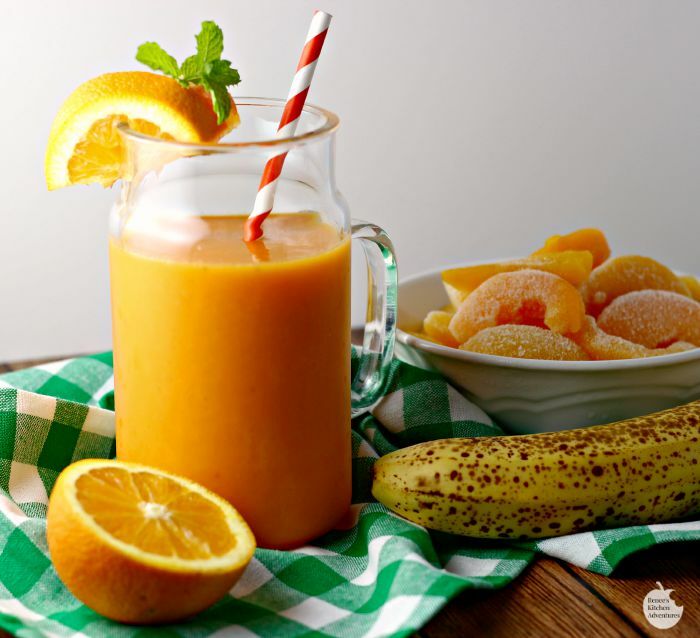 The flavor of this juice goes so well in this smoothie, you might not even realize it's in here! Although the name of this recipe implies that it is made of only two "orange" components, peaches play a role in it too...making it an "orange" trifecta of goodness! Nichole put chia seeds in her recipe, but I didn't have any, so I just omitted them. Still so delicious! I also used frozen peaches, because I don't like to put ice in my smoothies if I don't have to, so using frozen fruit helps to thicken it without the dilution of ice. If you want to use fresh or canned peaches, you can totally do that too, just use a few ice cubes to thicken it up! This smoothie makes a wonderful breakfast (and I might add a scoop of protein powder or some non-fat plain Greek yogurt next time for a protein boost!) or a refreshing afternoon pick-me-up packed with healthy, wholesome goodness. Some fresh ginger would also be another great addition! Thanks so much for this great recipe Nichole! I will be back to try more of your recipes so that I can, as you say, "cook, bake, enjoy"! 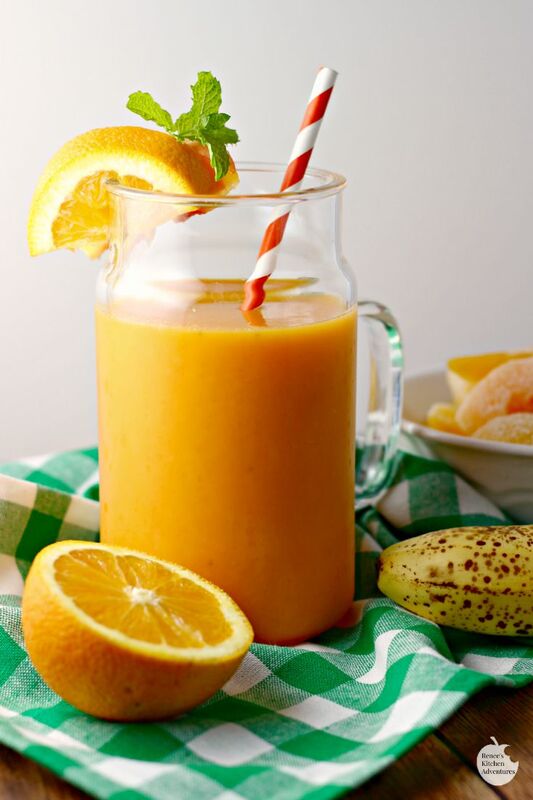 Orange juice, carrot juice and peaches come together for a flavor trifecta in this delicious and healthy smoothie! Combine all ingredients in blender and blend until smooth. If using canned or fresh peaches, add ice. Yum! A great breakfast treat! Gorgeous pic! I'm glad you liked it. And yes, definitely make the breakfast risotto...that stuff is life changing. I'm totally pinning this. And your pictures are gorgeous. And I'm going to make it for my kids for an after school snack. Wow, that color is amazing. I bet you get a super shot of beta-carotene from this smoothie. Beautiful. I'm happy to be new the SRC this month - I'd love it if you'd stop by and check out my post.